Reykjavik is an easy city to explore because of its compact size. We spent three days discovering this charming old town and made lots of stops along the way to read all the helpful descriptions provided at each site and tried some local Skyr and pastries along the route. 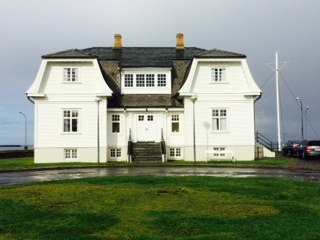 The Shore walk begins at Höfdi House on Borgartún, overlooking the bay. It is a beautiful stroll along the coast. The City Center walk starts at Government House while the Cathedral Square walk begins on top of the hill at Hallgrímstorg. The Harpa Concert Hall may also be included with the Shore walk as it is at the end of the boulevard and a hop and skip from the Sun Voyager. The Höfdi House is where détente saw light. The great thawing of ice between the United States and USSR (as it was known then) began with the meeting of Ronald Reagan and Mikhail Gorbachev in this house in 1986.